It was close to the Fargo Dome, shopping and restaurants. Kids loved the pool, that's our reason for choosing the Delta. Fitness center did not have functioning TV service to the machines or on the walls. Fruit that was in the bowl was brown and old. We ordered breakfast on the card for the door and the order arrived wrong and the pastries were dry and cold. The kitchen staff did do an excellent job in correcting our order when we called and were prompt in getting it up to our room. Overall, it's a good hotel. Where to find Detroit Lakes hotels near an airport? Where can I find hotels in Detroit Lakes that are near tourist attractions? Traveling to Central Minnesota? Would you prefer to book a hotel or apartment close to downtown Detroit Lakes? Within a 0.1-kilometre (0.06-mile) distance from central Detroit Lakes you'll discover 6 long-stay and short-stay accommodation options from which to choose. Hotels that are in easy walking distance of the Detroit Lakes city center, are the Best Western Plus Holland House and Americinn Detroit Lakes. 35 kilometres (21 miles) away from the heart of Detroit Lakes is the GrandStay Hotel & Suites Perham. This is an excellent option for those on a budget. 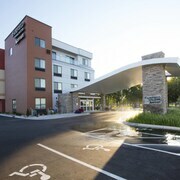 Another economical place to stay in this area is the Americas Best Value Inn & Suites. 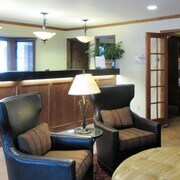 The Best Western Premier The Lodge on Lake Detroit is situated 3 kilometres (2 miles) from the middle of Detroit Lakes. 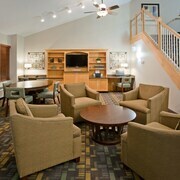 Another hotel is the Holiday Inn Detroit Lakes, which can be found 2 kilometres (2 miles) away. Some more hotel and apartment options worth looking into include the Super 8 Perham and the Budget Host Inn. Interested in seeing more of the forests and lakes that this area features? Why don't you spend some extra days in other places in Central Minnesota? You can visit local various sights or have a go at cross-country skiing and snowmobiling and then book a comfortable place to stay the night. 70 kilometres (42 miles) from Detroit Lakes is Fergus Falls, which is home to the Bluestem Center For The Arts. Moorhead is blessed with some nice Expedia-listed accommodations. Alternatively, you can visit Fergus Falls, 65 kilometres (40 miles) to the south of Detroit Lakes. While in Fergus Falls, take the time to enjoy the Central Lakes Trail. The Comfort Inn Fergus Falls and Americas Best Value Inn are all good places to lay your head. Just because you're traveling, doesn't mean you can't enjoy your passion for all things sport. Fargodome can be found 75 kilometres (45 miles) to the west of Detroit Lakes. Book a hotel nearby to the action at the Radisson Hotel Fargo or the Homewood Suites by Hilton Fargo. If you are flying into or out of Hector International Airport and would like to stay nearby try Candlewood Suites Fargo-N. Dakota State University or Days Inn and Suites Fargo 19th Ave/Airport Dome. What are the most popular Detroit Lakes hotels? New 2br, 5.5 Acre gem With Vista View of Straight Lake! Are there hotels in other cities near Detroit Lakes? 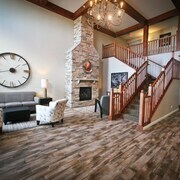 What other types of accommodations are available in Detroit Lakes? Explore Detroit Lakes with Expedia.ca’s Travel Guides to find the best flights, cars, holiday packages and more!